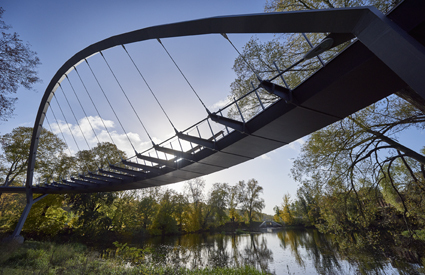 Nine footbridge projects were recognised in the awards programme. which is organised and sponsored by Bridge design & engineering magazine - six prize winners in five categories, and three highly-commended projects. "Beautiful design, geometry is excellent. This is a playful, provocative and innovative opening bridge which is sophisticated in its static position and poetic in operation. It adds a significant architectural value to this built environment." "A simple yet very effective solution which creates an interesting crossing for users even though it is fully enclosed. Jury found it hugely impressive that a box girder on this scale could be made without any u-frame, web or diaphragm stiffener. Very clever design and aesthetically strong." "A very clever structural solution allowing the creation of a fluid, lightweight deck threading through the landscape. Very high quality and sophisticated structural form has been achieved through form finding, and pleasant spaces have been created, both for those crossing the structure and for those who want to linger." 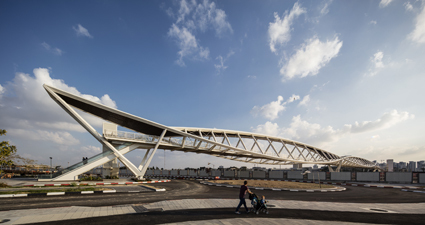 "A thorough, rigorous and well-resolved design and an imaginative concept for a long span crossing. 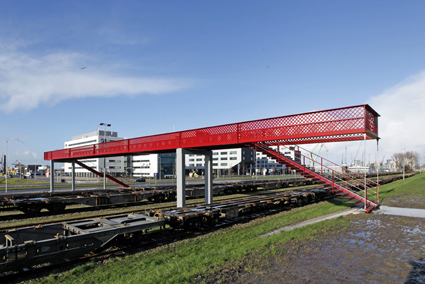 It fits well within the railway environment – the footbridge has a clear structural scheme with rhythm, and creates a space where pedestrians feel protected when crossing the train platforms." 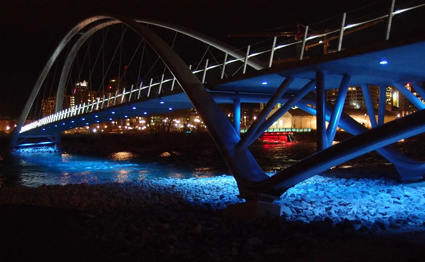 "By resisting the urge to light the arches of this footbridge, instead ‘floating’ it on a bed of light, the designers have highlighted the river below and created a distinctive night-time identity for the bridge. A restrained and sophisticated approach to lighting a large structure." "A very good rehabilitation of an old design with modern materials. The bridge has been refurbished while respecting the initial structure." 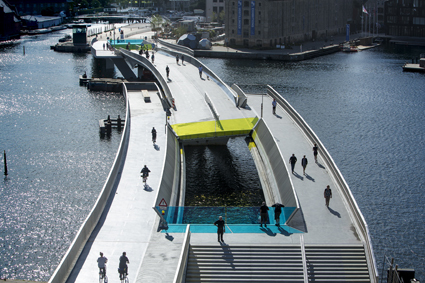 "A sustainable and understated bridge with significant community benefit. The development of the brief from a simple, practical ramp to a curvaceous route has added interest for users and the design and detailing is appropriate to the speed at which it will be experienced. 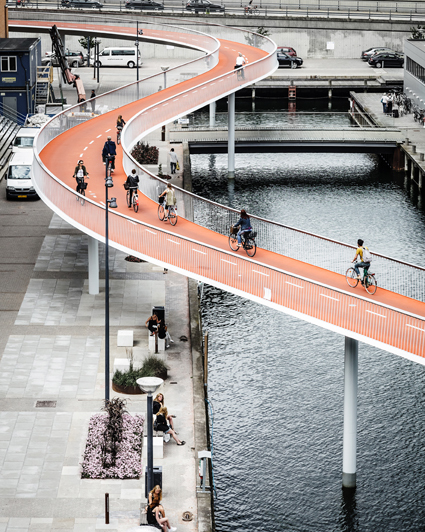 An integral solution, without bearings, which will reduce maintenance, while the plan curvature allows the footbridge to breathe." "Bold but with playful details; the jury liked the suspended staircase and the way the main deck is distinct from its supports, as well as the visual implication that the stairs fold down from the deck. 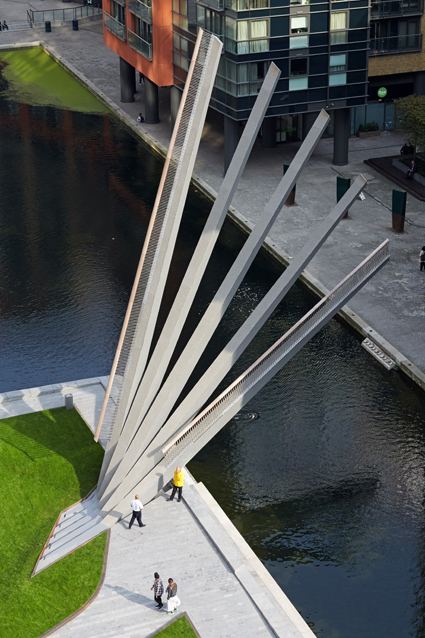 The piers are pleasingly simple and in keeping with the main structure, and the changes in size of the cut-outs enhance the visual interest." "An ingenious and very challenging design; clever, interesting, complex and contextual. This modern version of a movable bridge is powerful from below and exudes simple elegance above. 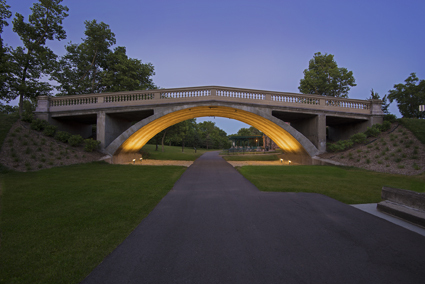 A very original movable bridge, adding excellent value to the community."